i wont be able to visit your blogs within the weekend as i will be trekking along a group with bloggers scud, mel, bryan, earvin and photo blogger allan. here's a photo of Pinatubo's crater our next destination. you can check out my previous post of my first Pinatubo trek in 2006. I hope you have a great time trekking this weekend.Take care. Have a great trip! Enjoy every bit of your trek. Take care. Ilang araw na tahimik si Mel at bry. Super nag prepare siguro ang mga yun. Ingatan mo sila Dom. Am pretty sure they will enjoy the adventure with you. Kaw pa, super the best na host. Halong-halong. have a safe and fun adventure! looking forward to your Pinatubo pics. Lucky you ! Enjoy ! wow! may group of bloggers din bang mahilig mag travel? yan ba yung group ninyo? ayos yan ah?! the water is just so calm and serene. Enjoy yourselves and be safe. oo nga pala. this weekend na yun. :) don't forget my crater lake water. :) tc! who would've thought that a volcano that raged and created chaos years ago would be that beautiful? Looking forward to your photos of this weekend! Have a nice trip. 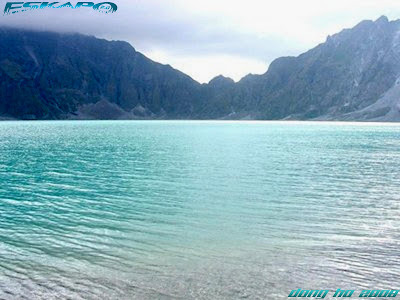 Hope to view more interesting photo of your trip up Mt Pinatubo. i miss zambales. Will go back there probably next week. Have a good trip! The destination seems thrilling. woooooooooow! the water looks warm and clean! :D enjoy your trek! stay safe. Have a wonderful time, Dong!! wow, so exciting! take care on the trek, dong! magandang adventure na naman yan! And I'm home na. lol. Ang adik ko. Nag-online agad instead na magpahinga na. Ang saya ng trip! Sa uulitin. Super thank you for being accommodating and nice to us. I hope you're safe. Good Luck! pasalubong ha...pwede bang mag request ng pasalubong?? Ganda ng tubig! I wanna go there one of these days! that's one big crater ! Beautiful! You are so lucky to be able to take this photo.